You can use Kool-Aid to add color to your homemade playdough. Most of these recipes require a short cooking time. This page contains recipes and ideas for homemade Kool-Aid playdough. Tons of fun for kids! Combine flour, salt, Kool-Aid and oil. Mix until water is ready, then add water (be very careful). Have an adult pour the boiling water and stir with a spoon until cool enough for a child to touch and mix thoroughly with hands. Let the child have the time of his/her life. They will love the smell. Mix flour, salt, cream of tartar and Koolaid in a medium pan. Add water and oil. Stir over medium heat 3-5 minutes. When mixture forms a ball in pan, remove. Knead until smooth. Let cool and place in airtight containers or baggies. Mix first three ingredients in a large bowl. Add the last 2. Stir until well blended. Remove from bowl and knead into soft dough. Store in air-tight containers. Mix salt, flour and cream of tartar. Add water, oil and food coloring. Cook till the mixture is thick and the right consistency. I store in Ziploc bags. Hint: Let the children get in on the act by measuring, etc. They enjoy it. I got this recipe from The Ultimate Book of Kid Concoctions, by John E. Thomas and Danita Pagel. Combine flour, salt, and powdered drink mix in a large bowl. Stir in cooking oil and water. Continue stirring until mixture is the consistency of bread dough. Remove dough from bowl and knead on a floured surface 2-3 minutes until firm. Store leftover dough in aritight container or plastic zip bag. Its easy and smells wonderful. Have fun. 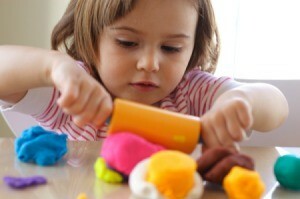 I am looking for a playdough recipe that I used to make for children and must make for my grandson! I have seen several different types of recipes but the one I am thinking of you do not have to cook, but I remember I had to add dish soap! am looking for recipe to make playdough using koolaid. Editor's Note: Here are some recipes we published in the past. This is a cheap way to make playdough that won't harm your child if eaten. Combine the flour, salt, oil and Kool-Aid in a bowl. Then bring 1 cup of water to a boil and add it to the bowl and mix well. Knead the mixture until your playdough has a nice consistency and let the kids have at it! You can make different colored playdough by using different flavors of Kool-Aid. Store in the refrigerator between uses. This recipe is so awesome! I printed it out and headed for the kitchen, telling my children that I was going to make play dough out of kool - aid, and they all thought I was crazy. But, they REALLY enjoyed watching it happen, and they're still playing with it, too! It was so cool! As soon as I got the recipe i tried it out. It seems as if me and my husband eat it more than our grandchildren do. My play dough that i made was very very sticky after a hour. How do you make it? I need help, it doesn't work. Hey this stuff worked so well, me and my friend Shae used it and it didn't stain clothes or hands. Well, I'm really happy with this recipe!